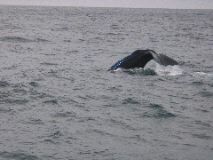 We woke up early and went on a Whale Watching cruise aboard a high-speed catamaran. 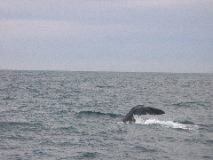 We ended up seeing about a dozen sperm whales, which was quite good considering they claim an average of 1-2 whale sightings per trip. 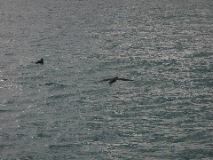 We also saw some Dusky Dolphins (who weren’t particularly playful that day) and some large sea-birds (including some albatross, though not the Royal Albatross). By the time we got back from the trip, the wind had picked up considerable and they had canceled the next trip, so we were really glad we got up early. 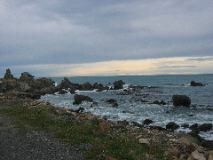 We toured around Kaikoura in search of their number two attraction, crayfish (very similar to lobster). We ended up getting one at a shack on the side of the road because most of the places in town were out. It was pretty good and worth the effort and price. We then decided to head back south towards Mt. Cook to take the ski-plane trip that we had missed out on before (a sizable commitment considering it was a 6-hour backtrack to Mt. Cook). At 0620 got up and started getting ready for our whale watching excursion. 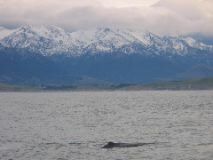 We arrived at the Whale Watch Kaikoura check-in at 0715. We stood outside and admired the views for a while. 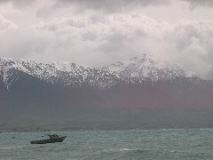 Kaikora is a little town on the coast with fairly big mountains that reach near the sea. It is really cool to see huge mountains next to the ocean. We also viewed their gift shop while waiting for the bus to take us over to the south bay to catch our boat. The boat left the dock at 0800. Whenever the boat moved at high speeds, we sat inside the boat and would only step out for times of viewing. This was actually kinda cool since the company had state-of-the-art graphics presentations that showed you real time travel speeds, direction, and ocean floor depths. In addition, a guide commentated the entire trip and we watched/listened to mini-educational excerpts about the things we saw and/or animals that are sometimes encountered in the area. We traveled out away from the coast to the continental shelf in the ocean. Not far from the shore, the depth to the bottom of the ocean drops fairly suddenly from <100m to >600m. The clash of nutrient-rich cold currents from Antarctica with the warmer currents moving down hit this shelf and creates an environment that is an excellent dining location for whales. 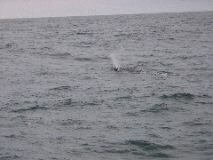 Within ~20 minutes, we spotted our first whales. The commentator told us in the beginning to expect to see 1 or 2, but that was generally the norm recently. We saw 5 at our first stop. 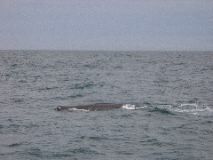 We would generally follow the male sperm whales until they decided to dive down. 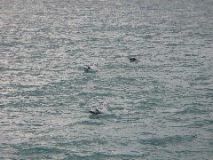 Several of them gave nice waves with their tales as they dove down under. 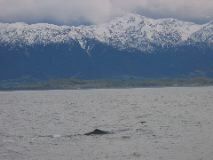 It was really amazing to watch the whales move around and flip their tales with beautiful snow-capped mountains as backdrops. 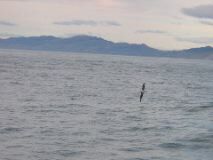 We also watched a wandering albatross in flight across the front of our boat. 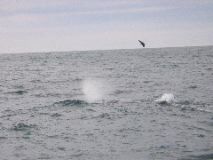 When the last sperm whale in the area waved good-bye, we climbed back into our seats and the captain drove over to another area in search of dusky dolphins. 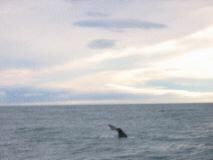 Dusky dolphins are one of the more acrobatic dolphins, so we were hoping for a good show. The captain located a few small groups of these dolphins who popped out of the water a little and played a little in the boat’s wake. 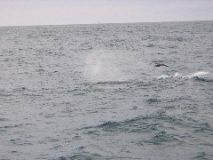 The acrobatics, however, were at the same level as the common dolphins we saw off the coast of CA on Lynette’s birthday this year. 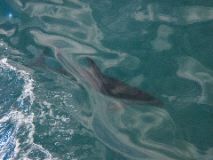 None-the-less, dolphins are always fun to watch. 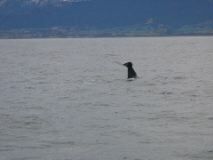 We also saw a fur seal near the boat giving us a little wave before we headed back out to the shelf to see if any of the sperm whales had resurfaced. Along the way, they showed us an informational presentation on the albatross, the biggest of which is the wandering albatross. Coincidentally enough, just as the presentation was over, we came across a large group of albatross, along with some giant petrols. A few of them were swooping around, gracefully gliding above the water, while others were sitting on the water taking a rest. 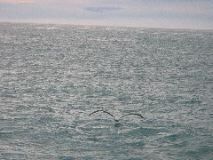 We had the pleasure of watching a couple of the huge birds take off, which involved them spreading their wings then running along the water before getting enough speed to fly. It was both hilarious and amazing to watch. 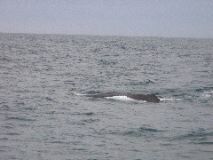 The sperm whales were no longer hanging out where we originally saw them, but the captain continued along the shelf, and sure enough, we spotted several more a bit further out to sea. 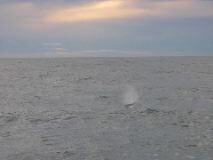 We watched three more sperm whales floating along, giving us a blow of mist on the average of every 15 seconds before taking a dive with their signature tail wave. Very cool stuff. In addition to the three we followed along, a couple more could be seen not too far away, but it was time to head into dock, so we left them alone. 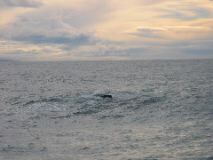 So, all in all, we saw almost a dozen whales (although some of the second group could have been repeats from the first group), which was well above their norm, which they claim to be one to two. We were quite thrilled about it. We docked, got off the boat and were bussed back to the train station, where the morning had begun. The wind had really kicked up, causing the cancellation of the 10am trip. We were, of course, very pleased that we had gone with their advice and taken the earlier trip. We picked up some postcards and headed towards the town center to try to find some of their famous crayfish, which is similar to lobster. We stopped at the information center to find an internet café and see if they had any suggestions for a relatively inexpensive place to get crayfish (like lobster, they’re quite expensive). We drove out to Pacifica on the wharf and found a grocery-store style seafood counter. They wanted $56/kg for a boiled crayfish. We decided that we didn’t have the tools required to eat the crayfish and that we’d try one of the local restaurants. We drove back to the town center and headed to the internet café before trying to get our crayfish. 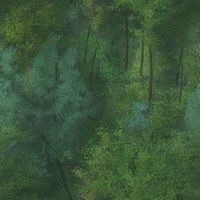 We spent about an hour and a half uploading the webpage (with a lot of the time spent trying to find an FTP utility on the internet since they weren’t laptop friendly and their computers didn’t have FTP utilities). We did a little shopping before popping into Sunshine Sushi, who were out of crayfish. 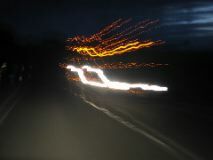 We then drove a bit up the road to the Continental Café, who were also out of crayfish. We were pretty hungry at this point, so we had their blue cod special, which was fish and chips, and we were both full for $5. Not a bad deal, especially since it was so good. By this time it was 2:30, so we decided to hang out in town until 3, at which point Mt. Cook Ski Planes would have their weather report. We did some more shopping and then called Mt. Cook. They seemed optimistic about tomorrow afternoon, but not 100% confident. Lynette left Jason with the decision since the ski plane was really his passion. 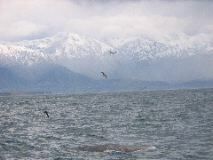 After a very painful process, Jason decided to skip out on the ski plane and head north towards Nelson and Abel Tasman National Park. We drove along a nice route up the coast until we got to Nin’s Bin, which our guidebook had suggested as a good, cheap place to get crayfish. Nin operated out of a camper and had various sizes of crayfish costing between $25 and $60. Jason opted for a smaller one since we weren’t very hungry. She cut it in half and took out the parts that she doesn’t recommend eating, then told us that the rest inside the shell was edible, including the legs. We sat in the pulloff and ate the crawfish, which was quite good. As expected it was similar to lobster, but the legs were similar to crab legs. Good stuff, worth the $26. At this point, Jason changed his mind about the ski planes. 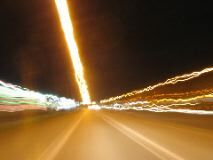 What the heck, you only live once, and this was a once in a lifetime type of experience. 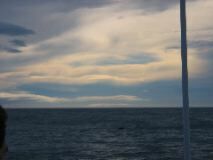 So, we headed back south towards Christchurch, which was about the midway point between Kaikoura and Mt. Cook. 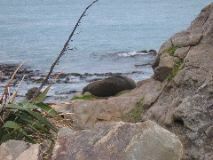 Just south of Nin’s Bin, we spotted some seals on the rocks by the road, so we pulled over to get a closer look. 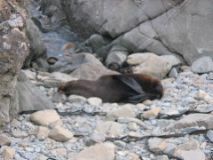 We were able to creep up quite close to them without them noticing us and took a close up of one that was sleeping. 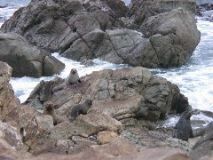 We peaked around a rock and were scared by a few cubs who were right around the corner. 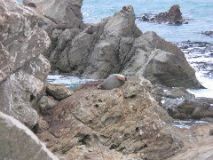 Apparently we also scared them, and after peeking curiously at us, they scrambled away from us over the rocks. Once they were at a safe distance, the peered back at us, trying to figure out what we were doing. It was pretty cute. 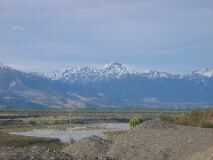 We drove back through Kaikora and on towards Christchurch. We learned that evening is playtime for the lambs in NZ because it seemed like every field we passed by had a group of lambs jumping and running together. They’re so cute! 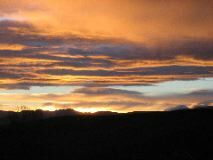 We were also treated to a wonderful sunset, and the drizzle overhead produced a vibrant rainbow, ALL of which could clearly be seen. 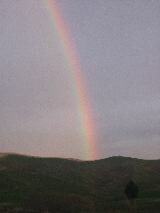 There was also a second full rainbow over the first, which was dimmer but still entirely visible. 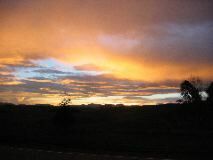 We snapped a few shots of the rainbow and sunset then drove on. 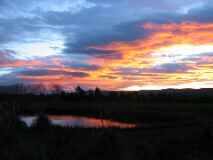 The sunset produced quite a show for us, making the clouds look like fire. 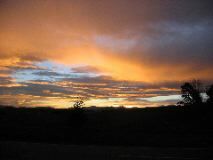 It was one of those sunsets that you could take a thousand pictures of and all of them would be spectacular. 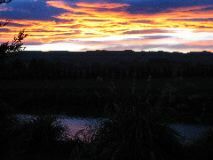 We arrived into suburban Christchurch at about 700pm, and flipped through our book for a place to stay. We decided on North South Holiday Park and arrived at 735pm. The sign on the door said they closed at 730pm, and we were pretty bummed, but the owner happened to be walking by as we drove up and we were in luck. We asked him a good place to pick up some All Blacks gear (the beloved professional Rugby Team representing New Zealand), and he suggested a mall down the road a bit. We paid him, dumped our grey water, which we hadn’t been able to do this morning, and found a spot for the night. We ate leftover pasta accompanied by Montana 2002 Cabernet Sauvignon Merlot, which was some pretty nasty stuff. It kind of tasted like drinking grass-stained wool, and made the nose sting a bit. We had some apple crumb pie, showered and worked on the journal a bit before bed.